As someone who has suffered from acne off and on since my teenage years – I am always on the lookout for that next miracle skincare product that will solve all of my issues but not break my pocketbook. Some have worked, while others weren’t worth the packaging they were shipped in. I have recently come across a serious contender in the skincare market that deserves a bit of attention. 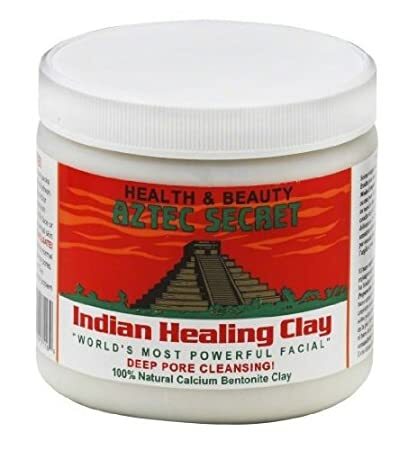 With claims that it is “the most powerful facial in the world” I was skeptical of this deep poor cleanser at first but, Aztec Secret Indian Healing Clay is powerful cleanser that is indeed- easy on the bank account. Clay and mud baths have long been part of beauty rituals since the days of Cleopatra and are still popular as part of every high-end spa treatment package to beautify and refresh the skin. However, the average consumer has largely forgotten about the many health benefits that clay offers- usually opting for expensive department store products that may not work half as well. Containing only bentonite (which forms from volcanic ashes) Aztec Secret Indian Healing Clay is 100% natural. It is found in Death Valley, California – having been dried in the sun for up to six months in temperatures of nearly 134 degrees. It is not formulated in a factory and there are no additives or fragrances. Indian Healing Clay is cruelty free – it is not tested on animals and no animals products in it. Bentonite itself has many purposes. It is commonly used for treating intestinal problems, allergies, as an ingredient in many home remedies and of course treating and healing skin irritations as well as promoting beautiful, healthy skin. According to Empowered Sustenance, bentonite “has a strong negative electromagnetic charge, and when activated by water, it acts like a magnet in and on our bodies, pulling metals and toxins to it” and drawing those same toxins out of the skin which is what makes it such a great addition to many a skincare regimen. Using Indian Healing Clay is fairly straight forward. Simply mix the clay with apple cider vinegar (equal parts) in a bowl (non-metal) until you have a smooth paste and then apply to skin. You will leave the paste on anywhere from minimum 5 – 20 minutes but can be up to 40 depending on your skin sensitivity. My skin is not sensitive so I went the full 40 minutes. As the paste dried, I did feel my skin tighten and there was a definite tingly feeling – but it was not uncomfortable. I removed the mask with warm water and many paper towels. If you find that the apple cider vinegar is to harsh for your skin, you can use plain water or brewed green tea which is said to be great for it’s antioxidant benefits. Don’t forget to moisturize afterwards, especially if you find the vinegar dries your skin. Aztec Secret Indian Healing Clay can be purchased on Amazon for as little as $10.68 for 1 pound to $20.87 for 3 pounds at the time of this writing. The biggest complaint I and others seem to have with Indian Healing Clay is that it is messy, especially when removing it. It can also clog drains if your not careful. However both of these issues are easily resolved. It’s recommended that you remove the clay at your sink with a paper towel or other cloth covering the drain to prevent clogs and some recommend wetting a paper towel with warm water – to place on the mask for a few minutes when you are ready to remove it. This will soften it so that you can wipe some of it away with the paper towel – saving your plumbing. Also, be sure to pin back your hair and wear old clothes or apply the clay before showering so that you don’t get the clay in your freshly cleansed hair. So before you head to the department store to pick up that expensive beauty treatment, you may want to consider trying bentonite clay, it may just be the miracle you were looking for. The author of this article was not reimbursed or compensated by Aztec Secret or an of it’s affiliates for this article.